EDITOR’S NOTE: All the photographs illustrating this article are from Mr. Meiser’s extensive collection. 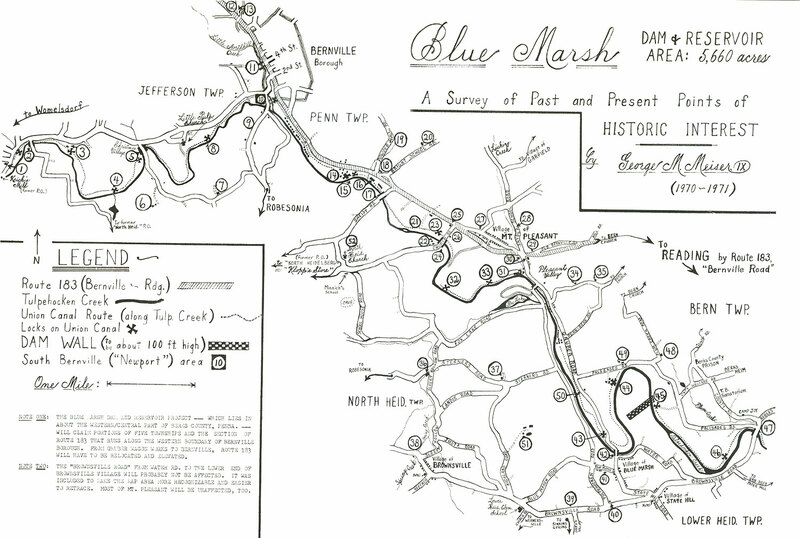 The survey presented here began upon the receipt of a brochure (dated January 1, 1970) entitled LAND ACQUISITION PROCEDURE FOR BLUE MARSH DAM AND RESERVOIR, TULPEHOCKEN CREEK, PA. issued by the Philadelphia Corps of Engineers, U.S. Army Engineer District. Besides information of a general nature geared to the interests of residents to be affected by the Project, this publication included a map of lands to be acquired which proved useful to determine the area in which to conduct preliminary investigation. It was a major point of activity (in the Berks County section) on the Union Canal from its construction in 1828 until operations ceased around 1884. Most of the vestiges from that enterprise still existing in our county are found in this area. It contains pioneer homesteads and early settlements largely unchanged in their basic characteristics—affording one the increasingly rare opportunity to sample rural living of a prior era. by an abundance of readily available water power. Many of these remain, in whole or part, to this very day. This has been the cradleland of families conspicuous in the development of our county. The following names figure prominently: Obold, Haag/Haak, Deppen, Gruber, Reber, Fisher, Dundore, Kalbach, Zerby, Conrad, Bright, Hiester, Stoudt, etc., etc. *Located about six miles northwest of Reading . project was authorized by Flood Control Act of 1962. . . . is one of eight major projects in the Delaware River Basin. . . . a total of 5,663 acres will be acquired. . . . dam will be an earth-filled rock-covered structure rising approx. 100 feet above Tulpehocken Creek located 1.5 miles above mouth of Plum Creek. . . . reservoir will have a total capacity of about 16 billion gallons. . . . dam will create a 1,000 acre lake about 8 miles long. *Acquisition of land to start early in 1970. . . completion of all land is scheduled for 1973. . .construction to begin in 1971 and will take 3 years. . . . cemeteries and private burial plots which would either interfere with construction or operation of the project, or be left isolated, will be relocated at Government expense by licensed morticians. As of April 14, 1971, many properties have been purchased by the Government, quite a few homes appear deserted, and some old structures have already been razed! Readers interested in following my trail— with cameras, of course—had better plan to do so immediately, especially in the Bern and Penn Township sections surrounding the village of Blue Marsh and the area extending two miles to the north. 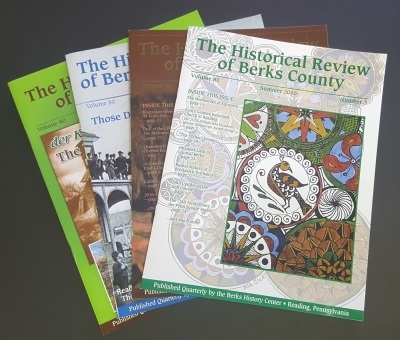 This article originally appeared in the Summer 1971 issue of The Historical Review of Berks County.